Serendipity Cabin (Wi-Fi) New Listing!!! 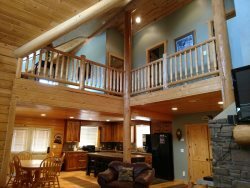 Enjoy Your Vacation in this beautiful Bear Lake Cabin. The Quality of this cabin is second to none. Spectacular views and unbeatable accommodations make this the perfect place to stay in Bear Lake! Note: Free Wi-Fi is available in this unit.